Now having been beheaded, he delights with a strange gladness. Having been killed by the sons of perdition with a sword. Wicked things are done to Arianus. The work of the sea shows forth the senseless ones. Wearing sacks as garments of illumination. 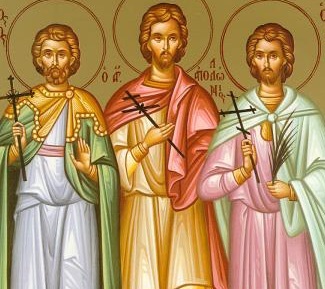 These Saints lived during the reign of Emperor Diocletian and the governor of the Thebaid of Egypt Arianus, the city of Antinopolis being in the Thebaid. The way of their martyrdom in 290 took place as follows: Thirty-seven Christians were arrested and led before the governor. One of them, Apollonius by name, who was a Reader in the Church there, because he feared the bitter torture of martyrdom, gave four gold coins with his clothing to Philemon, who played the flute, so that he could wear the clothing of Apollonius and change into his appearance, in order to sacrifice to the idols instead of himself. Philemon however, by taking the clothing of Apollonius and wearing them, immediately and perceptibly clothed himself in the faith of Christ. Hence upon entering the stadium with the appearance of Apollonius, he was ordered to sacrifice to the idols. He however confessed his faith in Christ. But when the governor ordered Philemon to come and play his flute, in order by the sweetness of his melodies he may motivate the one who confessed Christ in the appearance of Apollonius to favor the world and deny Christ and sacrifice to the idols, Philemon I say heard this, and revealed that he was the Philemon of whom he asked for, and who took on the appearance of Apollonius. The Greeks however urged him to deny Christ. Brave Philemon was not convinced. Then the governor informed him, saying that it was worthless calling himself a Christian unless he was previously baptized, for it was forbidden to be numbered among the Christians, unless first being baptized. Having been informed of this, Philemon prayed, and rain fell down upon him, which amazed all those present. Saint Philemon was informed that by this rain he was baptized by God, because no Christian dared baptize him for fear of the governor. Then the Saint prayed for his flutes to disappear, which he had given to Apollonius, when he took the coins from him, as mentioned previously. Fire thus came down from the heavens, and they burned in the hands of Apollonius. Because the divine Apollonius was the cause for Philemon to believe in Christ, he was brought before the governor and proclaimed his faith in Christ. For this they cut the nerves of his legs and dragged him throughout the city. Philemon was hung on an olive tree, and struck with arrows. The arrows, however, did not reach him, but it veered towards the governor and struck his eye blinding him. Saint Philemon made him well however. For he foretold to him that after his martyrdom, he was to take dirt from his grave and apply it to his eye, then he would receive his sight. 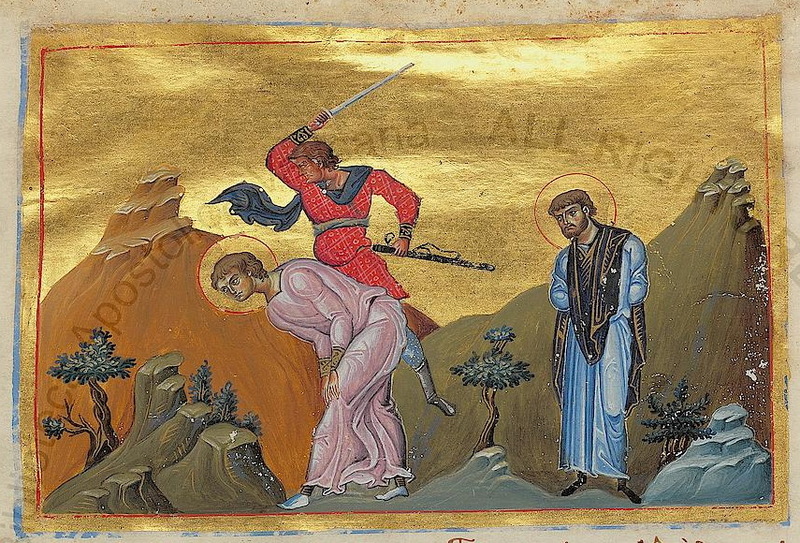 Therefore when Saints Philemon and Apollonius were beheaded, the governor Arianus went to the grave of the Martyr Philemon, and taking dirt from there and applying it, he received back his sight, just as it was foretold by the Saint. These words caused him to believe in Christ with four bodyguards with him, and they were all baptized. When Diocletian heard this, he sent soldiers to bring Arianus before him. Binding him with fetters of iron and hanging a stone around his neck, he was taken to a pit, and there he was covered with soil. Thus, since the impious did this, his throne was placed over the pit, and soldiers were ordered to mock him, saying: "Let us see if the God of Arianus will come and remove him from the pit." When Diocletian returned to his palace, he went to bed. And, O the wonder! He saw the iron fetters worn by Saint Arianus and the stone on his bed, with Saint Arianus lying down. This frightened him, thinking that he was a magician. Then in a calm voice the Saint said to him: "I am Arianus, whom you put in the pit and simultaneously blasphemed Christ." When Diocletian heard this, he was perplexed and remained speechless for a while. When he recovered, the fool considered this the work of a magician. Then he had him thrown into the sea with his four bodyguards that also believed. All five he had placed in a sack with sand. But then a very big dolphin dragged all five sacks on its back, leaving them on the shore of Alexandria. 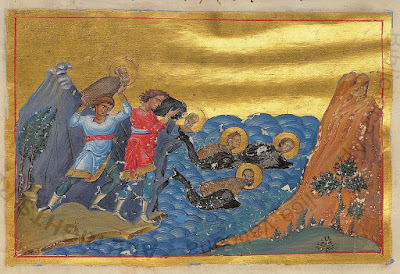 The servants of Saint Arianus awaited on the shore, according to his prior mandate, and they saw the relics of the Saints being transported on the back of the dolphin, and they were amazed, for it was reasonable to be amazed. Then, taking them with reverence they entered a boat, and via the Nile River they came to the city of Antinopolis, after a divine voice instructed them to go there, and there they buried the holy relics, and proclaimed to the city the strange miracle. Then all the people rushed over with lamps and sang hymns. Thus they were buried with celebration and honor in that place. "From this story, those Christians who play flutes, drums, lyres and other games and diabolical instruments, are to learn two things. First, they must hate those things from their heart, just as Saint Philemon hated them. They should not even want to touch them. Second, God abhors such instruments and is enraged by them so much, that he brought down fire from the heavens to burn them." 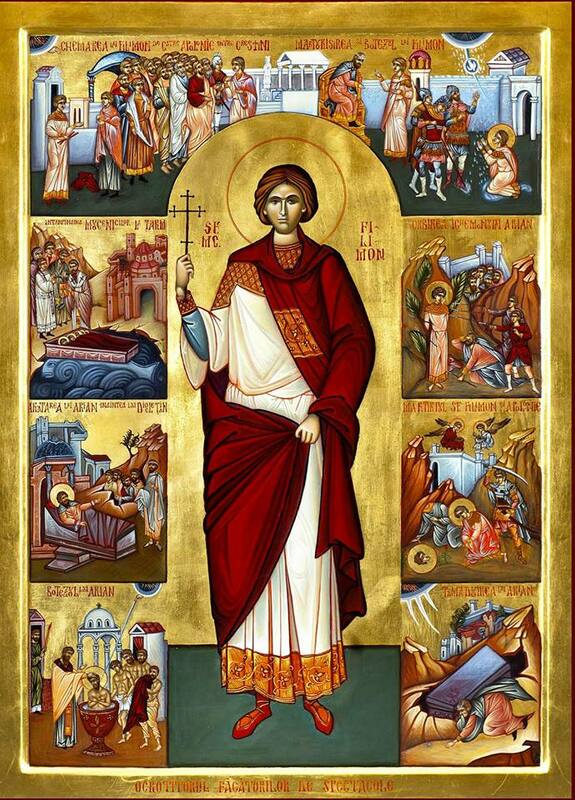 With garlands and songs let us adorn the seven martyrs, Thyrsos, Philemon, and steadfast Apolonius, Arianus, Kallinikos, Apollonia and glorious Lefkios, for they destroyed the enemy and are pillars of godliness. Together they shine on all the world with rays of heavenly grace. Let us gather today, and praise the Church’s luminaries, acclaiming them as fitting trophy-bearers of Christ our God.